Australian band Cub Sport is much closer than most bands considering two of its members, Tim Nelson and Sam Netterfield, have recently announced their marriage. With this being their first show in Austin, the band looked forward to enjoying many pastimes that Austinites enjoy such as going to Zilker and watching the bats. Cub Sport is composed of Zoe Davis, Tim Nelson, Sam Netterfield, and Dan Puusaari. Mohawk, the music venue right next door to Cheer Up Charlies, is a relatively small in size but has a big personality. Doubling as a bar and a concert venue, Mohawk opens up its doors to concertgoers under 18 at 8 p.m. As people started to gather in, a sense of camaraderie was felt among the crowd. People were talking about their favorite albums and songs and were also excited about their future music. 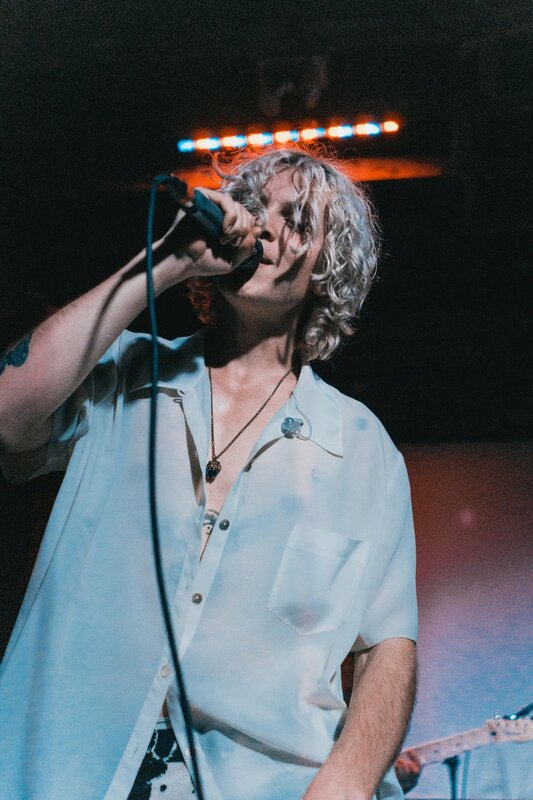 All of a sudden, the lights started to go dark and Cub Sport made their way onto the stage. They announced to the audience that it was their “first show in Austin”. This incentivized the crowd to become much louder. Playing songs primarily from their “Bats” album, the audience seemed to know every word that was coming out of Tim’s mouth. After a few songs were played, a couple of slower, somber songs were performed. It was during this point that Tim dedicated these ballads to his husband Sam. “We both struggled with our sexuality and coming out for the longest time”, Tim confessed. You could hear the passion in his voice and see the endearment in his eyes. The audience, including myself, were almost brought to tears. After the show, the entire band interacted with the audience at the merchandise table and was genuine with every person they got to talk to. It’s rare to find artists that are humble and excited to meet their fans. Cub Sport defeats the stigma surrounding the stereotype of bratty and rude artists and continues to authentically show a love for the people who support them. The following interview was conducted with Cub Sport band members and newlyweds Tim Nelson and Sam Netterfield. It has been lightly edited for length and clarity. Nelson sang to his audience at Mohawk with great control over his smooth vocals. How does it feel to be headlining your own tour this time go round as opposed to opening for acts such as The 1975 and Vance Joy? Tim: Headlining and opening are really different experiences. It’s really nice playing these shows knowing that people are there just to see you.There have been a number of people who have driven hours just to come to our show so that’s always really special. So I saw on y’alls Facebook page that you guys are really big dog people. Do you guys have any dogs at home? Tim: Yeah! We have two and we miss them so much. They’re golden retriever crossed with poodle. [Sam shows me a picture of them on his phone] We also used to foster dogs as well. Band members Sam and Tim recently announced their marriage. I also heard that y’all just got married. Tim: Yeah, just over two months. How did you guys meet and did y’all know that you would be together at that time? Tim: We met at school in year 8. I think we’ve always liked each other, but we were in different social circles. We were always in different choirs and musicals together and became good friends. When we graduated from high school, we started spending everyday together and we’ve pretty much spent everyday together since then. Do y’all have any plans while y’all are in Austin? Tim: I’ve literally heard only incredible things about Austin. We really want to see the bats. I’ve actually never seen the bats, but I’ve heard they’re really cool to witness. Our last album is called “Bats” because where we lived, it was just up the hill from a big colony of bats. I used to Snapchat it all of the time and someone from Austin replied and said “That looks like the bats here” and so I decided to write a song about that. Are you guys working on any new material? Tim: Yeah, our third album is finished. We’re literally just mastering and finalizing the tweaks so we should have the finished album soon. Sam: There should be an announcement next week. What goes into y’alls creative process in writing music? Tim: I write and record everything. So I sometimes have musical ideas or lyrics come to me and I usually write it in my phone or record a voice memo. After that, we’ll usually go to the studio and record. Since we’ve been touring the States, I’ve also been writing some stuff in the tour van in my laptop. There’s some stuff that I worked on in the van in April that’s going to be on our third album.